Byron Shire’s Simon Richardson seems high on life, but not in the way some might suspect a Byron mayor might be. Last Saturday I came across him as he sped down the footpath of Rue Réaumur, at the top of the 2nd arrondissement, on a rented bicycle. I had stopped to admire a row of electric vehicles charging near the footpath while they waited for their next share clients. Installations like these are dotted across Paris and that, says Richardson, is what he would like to see in Byron Bay and surrounding towns. Richardson’s plans don’t end there. 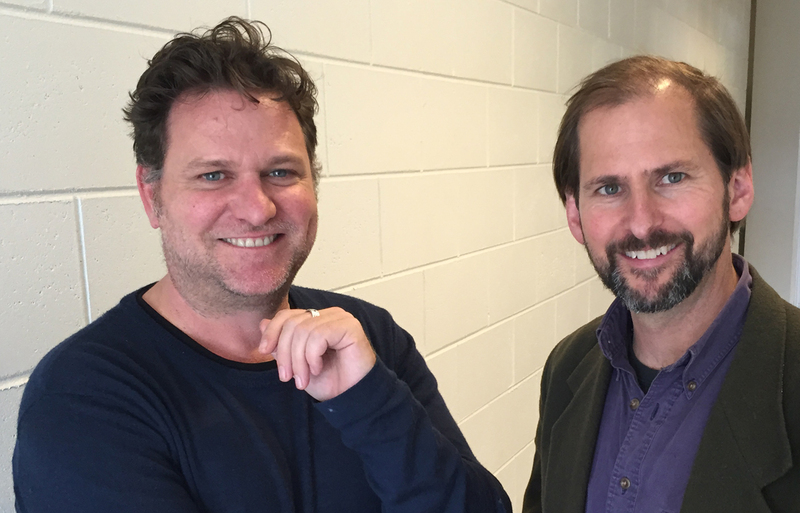 Byron shire is working on a project to take the region to zero net emissions within a decade. Amid a flurry of activity in the northern rivers area, a whole range of fascinating possibilities is emerging – the creation of the country’s first community-owned energy utility, for instance, and even the possible buyback of the local electricity network to create a renewable energy–powered micro-grid for the region. The reason that Richardson is in such a state of excitement is that here in Paris, in and around the climate talks, hundreds of mayors from across the world and dozens of regional and sub-national leaders are speaking the same language. “It’s fantastic being here learning what others are doing,” he tells me. And in Paris, Richardson notes, it is the sub-national governments – the councils, regions and states that California governor Jerry Brown dubbed the “super nationals” – that are raising the bar on climate action. Unlike national governments, they are actually delivering on the targets needed to respond to the science. And a surprising number of Australians are among them. Here, too, is the mayor of Adelaide, Martin Haese, who wants his city to be the first major capital to reach carbon neutrality – a target he hopes to reach as early as 2025. He has pioneered a series of battery storage incentives to encourage homes to install devices that could help manage the extraordinary levels of solar power in the local grid. Sydney lord mayor Clover Moore is in Paris too, pushing her city’s goal of cutting emissions by 70 per cent by 2030, and lamenting the restrictive rules that prevent her team from reaching the goal any earlier. Simon Corbell, the ACT environment minister who masterminded the territory’s plan to source 100 per cent of its electricity needs from renewable energy by 2025, is also here. Corbell’s program – with its successful reverse auction tenders – has kept the large-scale renewable energy industry alive in Australia virtually single-handedly, while federal fiddling with the renewable energy target brought the sector to a virtual halt. And here, too, is SA premier Jay Weatherill, who is heading a twenty-strong delegation promoting that state’s plan to attract $10 billion in clean energy investment over the next decade and achieve net zero emissions by 2050. South Australia, he says, will reach its 50 per cent renewable energy target next year, nearly a decade ahead of schedule. He intends to chart a course to bring the state as close as possible to 100 per cent renewables. It’s an extraordinary target that puts the state at the cutting edge of clean energy innovation. It carries some risks, but could bring huge rewards. Weatherill wants the state to be an innovator in energy storage and at the forefront of electric vehicle adoption and driverless car technologies – know-how he is convinced the state will be able to export. He would like an electric vehicle manufacturer to set up operations in the state as it waves goodbye to the makers of internal combustion engine cars in 2017. Weatherill’s ambition to achieve zero net emissions seems radical in a country still wedded to fossil fuels and dependent on coal as the major source of electricity. Next March, however, South Australia will join Tasmania (already near as dammit to 100 per cent renewables) and the Australian Capital Territory (getting there within ten years) in being free of coal-fired power stations. All this is evidence of a disconnect between the ambitions of local, regional and state governments like Byron Bay, the Australian Capital Territory and South Australia, and that of the national government in Australia. And the pattern is being repeated across the world – in Europe, the United States, Canada and elsewhere. California governor Jerry Brown expanded a little on those opponents in a conference with Weatherill in Paris on Monday. They are, he said, businesses and politicians who fail to imagine anything other than past practices. This failure of imagination perhaps best explains the disconnect between state and regional governments and Australia’s federal Coalition government, and between the Coalition’s own rhetoric and actions. For all that Malcolm Turnbull would like “innovation” to be the buzzword associated with his government, it is all but absent from where it is needed most – in the transition to a decarbonised economy, possibly as early as 2050. Last week in Paris, environment minister Greg Hunt highlighted how the Turnbull government is dealing with the climate targets it is bringing to Paris. For the government, it is essentially an accounting issue, one in which Australia can use a favourable deal in Kyoto way back in 1997 to help reach modest targets for 2020 and 2030. Australia, Hunt insisted, will meet its 2020 target of a 5 per cent cut in emissions from 2000 levels with ease. And even though five European countries have decided to tear up their surplus credits, amounting to more than 620 million tonnes of CO2 [subscript 2] equivalent (or more than Australia’s annual output), Australia has no intention of doing the same with its surplus of 128 million tonnes. “The important thing is for Australia to meet its targets,” Hunt said. And it appears that it will do so without even having to reduce its level of industrial emissions. Indeed, for nearly every tonne of abatement the government is buying – at the average price of around $13 per tonne, it says proudly – another tonne of CO2 [subscript] equivalent is being emitted by the electricity sector alone, as the brown and black coal-fired generators reassert their dominance over the energy mix in the absence of a carbon price. Yet, at the same time, Australia is supporting a target of “well below 2°C,” and even a reference to a tighter target of 1.5°C, without having any long-term policies to meet those targets. (They were dumped with the removal of the carbon price.) The minister didn’t blink when asked about this after arriving in Paris for the final week of the talks. 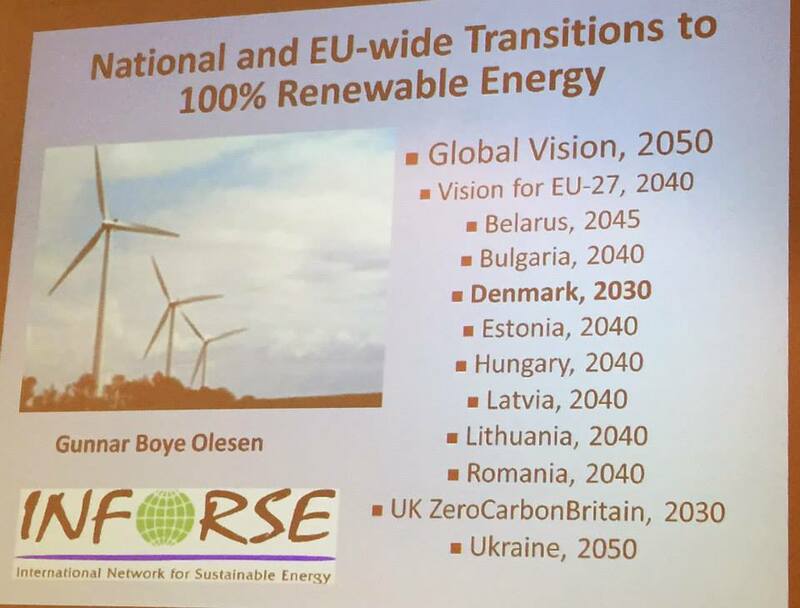 “Ours is a 2030 target,” he said. This disconnect is extended through to other policy levers. The government is focused on innovation, yet it refuses to ditch legislation that would abolish the very agencies that could deliver it – the Australian Renewable Energy Agency and the Clean Energy Finance Corporation. The Greens are the only party that seems to understand that this is any sort of problem. They have sent both energy spokesperson Larissa Walters and leader Richard Di Natale to Paris, and must be rejoicing that the sort of policies they advocate are not deemed radical here, as they are in the Australian press, but part of the mainstream of the conversation going on in Paris. Giles Parkinson is editor of RenewEconomy. I would like to thank Byron Shire Council for its’ support in assisting me to accept the invitation to attend and present at the technical expert meeting on energy efficiency in urban environments 5 – 6 June 2015 in Bonn, Germany, as part of the United Nations Framework Convention on Climate Change preparation for the Paris Climate Change negotiations. The purpose of this meeting was to examine the opportunities for accelerating energy efficiency action in urban environments. I had the opportunity to present and participate as a panel member on two forums, both of which were to promote the emission reduction initiatives within Byron Shire, including Council’s resolution to support the goal to become Australia’s first zero net emission community by 2015. Following are some observations from my experience; these are my observations gleaned from conversations with attendees (ranging from the head of the Australian delegation team, to activists), my own knowledge and understanding and that gained from information shared on panels, forums, events and workshops. There were two terms that were ‘terms du jour’- Leapfrogging and Co-benefitLeapfrogging was generally used to mean jumping over the current or new technology or measures and onto one further ahead. It showed just how quickly the technology and opportunities are flowing. The speed of change was palpable and the desire to keep apace was illustrated everywhere. With everyone seeking accelerated progress, leapfrogging say from just promoting double-glazing to requiring whole building sustainability was where conversation and action sat. Another example is the regular use of term of leapfrogging a business or nation’s current emission target due for 2020, to one far more ambitious due to current results above projections. Co-benefit simply means as it suggests: value adding, or extra benefits. It was used all the time when discussing benefits of a carbon emission reduction measure and yet, clearly seemed a relatively new focus as many commented on needing to talk in terms of co-benefits, suggesting previously the negotiation narrative was mainly only about emission reduction for environmental reasons alone. For example, not just advocating the emission benefits of public transport, it was constantly couched with health benefits, decreases in car accident deaths, economic benefits etc. A government representative from Ethiopia gave a great presentation. He outlined that for his country the narrative was reversed. For Ethiopia, it was about economic, health and social improvements that had a co-benefit of carbon emission reduction. They are looking to double the size of their economy in 20 years, with the goal of no increase in carbon emission- staggering! One point of contention though is that they are heavily reliant on hydro schemes that could have huge implications for nations downstream. Begun in 2011, they are tracking well. Carbon Sequestration. Long considered by the Australian government as the great elixer for Australia’s problems, carbon sequestration seems to have very little currency here. It is considered an idea with little application. Apparently Canada is moving in this direction, however, carbon sequestration requires very specific preconditions. It requires extremely stable underground conditions, highly advanced knowledge of the geological process and realities beneath the ground and is only economically viable on a large scale. With so many options and actions that can create real change and carbon reduction, to say it is on the periphery of global technological options or prioritisation is to give it too much weight. This is where the global attention lays. Examples from across the world were shared consistently. However, smaller scale, self-contained energy creation was also highly valued. Turning a building into a power station, with solar and batteries fuelling the house and car was seen as the logical progression. The mood was quite optimistic, mainly because of the US/China declaration a few months ago has completely changed the game and added to that, a recent decision by the Canadian government to pay its share into a global environmental fund- left Australia alone in refusing to do so- though we have now agreed or are about to agree to pay into this fund now also. These two acts have seriously isolated Australia to the point that we will most likely go along with the momentum rather than resist. During the conference, national delegations spent all their time fine-tuning a document that can be tabled at Paris for global approval. It was a long and arduous process, with only 5% of the draft document having been worked through after 5 days. During this process, each nation had 30 minutes to outline their efforts at emission reduction and their overall view of the working draft and any specific ideas to improve it. The floor was then open to all other nations to ask the subject nation questions. Australia received the most questions; mainly accusatory in nature. The Copenhagen conference was viewed to have failed for two main reasons- there was not a document ready for approval and thus too much work was required at Copenhagen in too short a time to produce something that could be agreed upon, and secondly, the main actors- China, the US (and Australia and Canada) deliberately attended Copenhagen to destroy chances of agreement. Thus, work was being done in Bonn and elsewhere between now and the Paris Conference to have a document ready. This combined with a new readiness by the US and China to sign a deal makes it far more likely and the mood very optimistic amongst negotiators. Bottom up actions have created great optimism and Copenhagen seems a long way in the past. Regions and cities are greatly driving the renewable energy and emission reduction sectors. For example, electric vehicles are exploding in their take up by cities and regions- the Spanish region of Catalonia alone now has over 1000 recharge stations. The global group, ‘the Council of Mayors’ has a target of 20% emissions reductions, though many have more and 30% is now the norm. In fact, though the European Union has a target of a 20% reduction, it is currently tracking at 25% due to business and cities and regions exceeding previous estimates. Regardless of what their national governments are doing or not doing, cities, states and regions are moving at breakneck speed and the force is irresistible and irreversible. A great forum was facilitated by the CDP-We Mean Business- Coalition (270 multi-national companies, each at least a billion dollar company: http://www.wemeanbusinesscoalition.org). The new narrative that is gaining force is that climate action is a historic opportunity for business within the boundaries of natural systems, rather than a sacrifice. The forum proposed the need to acknowledge and value the notion of ‘ambition’; a need to move action within a framework of ambition. Action alone will not get us there; ambition is crucial to direct and focus the actions. Across all events and forums it was consistently advocated by business groups that business needs certainty to facilitate innovation and technology and needed to know governments are in it for the long term, with periodic progress towards achieving ambition. Business sees carbon pricing as the crucial key for this; there is no better way to create certainty than installing carbon pricing. And this will spur the real economy into action, bearing in mind that though the current governmental emission mitigation funding runs into billions, the real economy works in trillions not billions. Thus, we need to create the certainty to make these trillions flow into low carbon economic development. It is worth noting that whilst I was in Bonn, BHP called for the Australian government to put a price on carbon.It was outlined that one of the main drivers for business climate change action is a fear of climate change risk-especially in food and agriculture sectors etc. Another is fear of brand risk; this is also huge, as companies don’t want to lose customers due to their poor action or negative inaction. Policies are now well known-it is all about implementation. The concept of zero emission is now mainstream and it was great to sit within the zero emission cohort. Again, during the conference and after slamming Australia for its reticence, Kofi Annan espoused the need for a zero net emission target. Also, Zero Carbon Britain, a framework to achieve the goal was shared and will be launched in a few months. Zero Emissions is now a globally accepted goal and necessity in order to achieve acceptable global warming levels. Speaking to one of the Australian negotiators, he is excited about getting a decent outcome at Paris, as Australia will not have the other big carbon heavyweights of Canada and the US to hide behind and thus resist negotiation outcomes. This in turn, could lead to a massive economic emphasis back here for emission mitigation support. It can’t come soon enough. Australia was somewhere between a derided state actor and an outright pariah here- thank goodness it wasn’t a sporting event with everyone wearing their nations tracksuits, here, out of uniform at least Australians were anonymous! Though Australian chain draggers say we are only a tiny nation etc, in Bonn, Australia was considered a significant and important nation. At many discussions, in charts and during events Australian inaction was derided and noted and all had knowledge of our government’s stance. This was one reason I believe that Byron’s actions were so roundly supported- it seemed clear that ‘good news stories’ or positive case studies coming from Australia were extremely rare- to be generous. The world looks at us in puzzlement; they struggle to understand why we would be turning our backs on an economical re-boot the likes of which would never happen again. They see our wealth. They see our land, geographical and favourable renewable energy conditions. They see our expertise (as many Australians are leaders across the world in renewable technology) and they cannot understand why we are not driving the train, but instead, are standing on the platform deciding whether to buy a ticket to ride in the cheap seats. The Australian negotiators were a committed bunch who I gleaned were itching to be able to negotiate in good faith and with clear direction to join the sign up on the process and not hijack or try and destroy it. One delegate in particular was extremely keen to support our initiatives an she wrote a letter to Environment Minister Greg Hunts department informing them of our work. 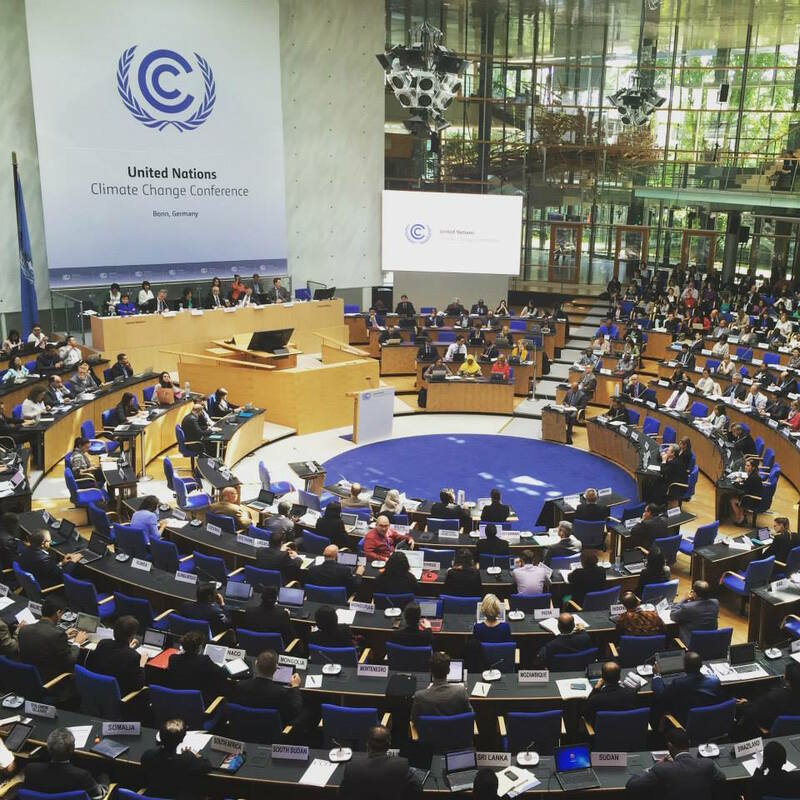 It was striking to observe the many types of organisations present in Bonn, the many areas of focus for emission reduction shared and the many different outcomes sought. However, though there was great diversity throughout the rooms and corridors of the conference centre, there was a central focus- establishing a framework for the future sustainability of the planet. The notion that we are all in this together was palpable throughout the conference; which was a main reason for the similarly palpable frustration about Japan’s, Canada’s and Australia’s recalcitrance at joining the vast majority of countries in committing to a significant emission reduction target. Political leaders and major stakeholders were working towards setting a long-term strategic document to set a course to achieve a sustainable future for the global community. Experts, focused organisations were tackling the details, the components and the examples that are needed to achieve the overall sustainable goals. Whilst the political leaders hammered out long term strategy, the expert practitioners showed how it could be done, how it was being done and successes already achieved. Activists moved in, around and between the political and expert practioners to: tell the emperor they wore no clothes, provide support for smaller initiatives, advocate for change, tug heart strings of decision makers, provide moral and to community support for bold initiatives that can achieve outcomes that will support measures to achieve sustainability. They shone the light of truth on decision makers and ensured that the future of the planet, and its future inhabitants, both human and non-human were what it is all about. The overall direction, headed up by the nation state negotiators and political leaders, will most likely be focused around achieving a global warming level of 2% or lower. There are some players who are intent on minimizing the scope of the document, and Australia is one such player. However, with the US and China recently committing to large emission reduction targets and with the developing world embracing massive reductions, Australia will most likely sign on the dotted line with everyone else if a declaration is created. The Australian negotiators I spoke with all believe we will sign up ‘to something, if something is tabled’, with the emerging lack of friends to hide behind the articulated reason. Of course, the caveat to that prediction is our PM, who, seen in recent deplorable anti- renewable comments, seems as globally responsible as Kim Jong-un of North Korea and as economically astute as Ronald Wayne, cofounder of Apple who sold his share for $800. Aside from the positive promotion of Byron to organisations and people from around the world, other benefits may flow from the trip. Already, Byron and its’ aspiration have featured in newsletters, (‪http://track0.org/2015/07/read-track-0s-may-june-newsletter-here/ …), radio coverage and Australian industry attention. However, the benefits may be realised later. By becoming known to the Commonwealth government, Byron is beautifully positioned to gain from the commitment Australia signs up to at the Paris conference. With the ALP signaling an intent to vastly increase our renewable energy output, the Libs will no doubt increase its commitment. Any increase in emission reduction target will ensure more funding and investment in renewables occurs. With the Department of Environment aware of our willingness and ability to be a case study for large scale, community wide renewable projects, we can be at the front of the line when projects are funded and supported. -and it needs the collective will from community, business and government leadership. Byron Shire has acknowledged this and has committed itself to pursuing the goal to become Australia’s first zero net community-within 10 years. Using the roadmaps developed by Zero Carbon Australia, Byron shall undertake, alongside partner Beyond Zero Emissions to develop a local roadmap to transform its footprints in the areas of Energy, Waste, Transport, Land Use and Buildings. The process involves identifying and assessing building stock, assessing emission reduction opportunities in each building type and forming partnerships. This will be in conjunction with the work already occurring within the shire and region. Sustain Northern Rivers (SNR)– formed in 2008, SNR isa collaboration of 26 peak regional organisations working together for sustainability. It has four working groups across the themes of Food, Transport, Biodiversity and Energy. ENOVA, launching In July, after previously obtaining Governmental support for abusiness plan, will be Australia’s first community-owned renewable energy retailer. It seeks to break the current energy monopoly in Australia- as today only three large energy companies dominate the retail spaces-who are all involved with the unpopular and unsustainable CSG industry. Backed by their large fossil fuel generation, they account for a third of Australia’s greenhouse gas emissions and have overseen a doubling of prices over the past 5 years. And finally, Byron Shire Council has initiated and gained support for an Australian first- developing a Virtual Net Metering trial. It has already received State government funding and a Federal agency will be publicising that they are on board with financial support in the next few weeks- including supporting an expanded trial with other councils across Australia. Within the energy and building sectors, Byron is very aware that the current market structure was not designed for local energy. Byron is aiming to work in collaboration with other councils, network businesses, and electricity retailers to trial alternative market structures to allow reduced charges for partial use of network and incentivise local generation and use. For Council, it will begin by using the excess energy produced on our sports centre roof to offset the energy required by our nearby Sewerage Treatment Plant. This can all occur, because as I said earlier, in Byron we have a community heart that doesn’t just accept the science of climate change, but insists in being part of the solution to it. It is a mindset and collective pulse that propels us. And the aspiration to become Australia’s first zero net community is one we relish. Hans LovejoyWhile Australian governments are undermining the renewable-energy sector, there’s positive action from local not-for-profit groups and Byron Shire Council.And to facilitate a unified plan of reducing fossil-fuel emissions, not-for-profit research and education organisation Beyond Zero Emissions (BZE) held a workshop with mayor Simon Richardson at Cavanbah (the Byron Regional Sport and Cultural Complex) on Sunday.BZE CEO, Dr Stephen Bygrave, told The Echo the forum was aimed at creating plans which could reduce emissions across five sectors of the economy: energy, buildings, land use, transport and waste.‘We are bringing council and all the community groups that are already doing the work under one umbrella, and are setting out a strategy on how we can achieve zero emissions.’He says council’s intention to take Byron Shire to a zero-emissions economy over the next ten years creates an opportunity to lead, ‘and then others will follow.’The group of around 50 also discussed ways of encouraging high-end energy users to become sustainable.They include developers vying for new housing estates, energy providers and Rous Water, the local utility that provides several north coast councils with water. Emerging micro-grid technology was also explained, whereby small networks of houses/businesses that are producing excessive solar power can feed into the grid to another network which may be experiencing extended cloudy weather conditions.Siemens representative Warner Priest was also at the meeting, and told The Echo his company has a keen interest in micro-grid technology.The next step, Dr Bygrave says, is to establish working groups for the five sectors.‘We don’t want it to be overly bureaucratic – we want to provide enough structure and guidance so the community groups can get on with what they do best.’‘We will develop a common action plan template for each group, and a baseline of emissions will be established from each group, from each sector. 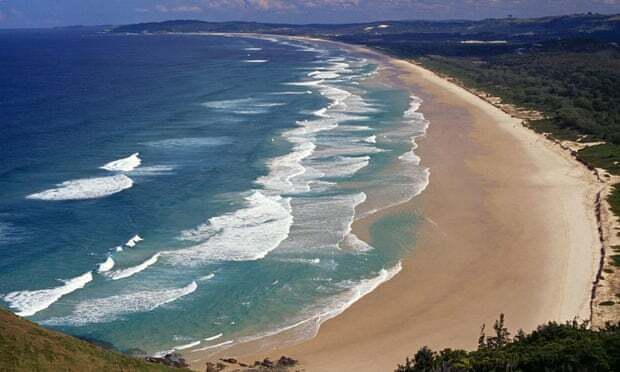 Byron Bay has become the first place in Australia outside the major cities to commit to cutting its greenhouse gas emissions to zero over the next 10 years.Byron shire, which encompasses Byron Bay and parts of the New South Wales north coast hinterland, said it aimed to be a “zero emissions community” by 2025 by cutting greenhouse gases in a range of areas.The plan will involve boosting renewable energy uptake, retrofitting existing buildings, creating new public transport options and electric vehicle opportunities, changing land use practices and improving the management of waste and water.The council will be the first to use research conducted by Beyond Zero Emissionson how to take Australia’s economy into “negative emissions” and help global efforts to avert the prospect of dangerous climate change.Beyond Zero Emissions said it was in conversation with a number of other councils to implement similar emissions-cutting strategies.The City of Sydney and the City of Melbourne both have policies to be “carbon neutral”, while the South Australian government announced a similar plan for Adelaide last month.Simon Richardson, mayor of Byron Shire, said the region was already making efforts to cut emissions through its strong take-up of rooftop solar and its launch of a community-owned clean energy generator and retailer last year.“Byron is a logical fit for this because we are well on the path with renewable energy – you don’t need to twist many arms in Byron,” Richardson told Guardian Australia.“Beyond Zero Emissions have put together a roadmap and we’ve taken up the mantle. It’s a whole-of-community approach, with renewable energy, agriculture and buildings.”Richardson said the details of any incentives or penalties to push down emissions still needed to be finalised, but that he was confident Byron could get state or federal funding where needed.“Transport is probably the biggest challenge as public transport around here is pretty poor but we’ve got a rail corridor that’s underutilised,” he said.“We’ve had indications from the state government that they want to explore this space. There’s an economic argument too, not just a feel-good environmental outcome. We can save money from polluting industries, there are clear economic benefits.”Beyond Zero Emissions has developed research on removing emissions from waste, energy, transport and land use with the help of the University of Queensland and the University of Melbourne.Steve Bygrave, chief executive of the non-government organisation, said there’s a “very holistic” approach councils can take to lower emissions.“We’ve shown that every existing building in Australia can be retrofitted to become zero emissions,” he said. “Better public transport and electric vehicles won’t happen overnight, but we want to roll this out to every community in Australia.“There is a lot of frustration with the national government, as shown by the lack of vision in the intergenerational report when it came to climate change. People on the ground just want to get on with it, regardless of the lack of progress nationally, and councils are well placed to do that.“The required scale of action needed on climate change is unparalleled. But when you look at large changes in the past, it always comes from the bottom up. Political leaders have to respond to action on the ground.”Bygrave said he had spoken to councils in Victoria and NSW and would be targeting Queensland’s Sunshine Coast next to get further commitments to slash emissions to zero. Byron Council yesterday voted to support the mayor’s stated ambition to become Australia’s first ‘zero emissions community’ after a relatively low-key debate. Mayor Simon Richardson told council the aim would ‘cost ratepayers nothing’ as the shire would benefit from ‘hundreds of thousands of dollars worth of expertise’ from the group Beyond Zero Emissions (BZE), which would hold community forums and advise on local energy saving and generating methods. Dieter Horstman, organiser of this weekend’s Byron Solar Revolution Symposium, commended the mayor for his vision during public access. Mr Horstman said his honey factory was already an example of a zero emissions industry, as it was ‘powered by solar energy backed up by 100 per cent pollution-free salt batteries’. The new battery technology will be on display at the symposium, to take place at the Byron ECO Park tomorrow (Saturday March 21). The wording of the motion was changed slightly to remove the word ‘first’ after Greens councillor Duncan Dey said it was a worthwhile aim regardless of whether Byron ended up being the ‘first or fifteenth zero emissions community’. Mayor Richardson told the meeting that BZE experts would look at all areas that contributed to the consumption, saving and generation of energy, including domestic, council business, transport and agriculture. ‘In a rural area such as this, transport is going to be the most difficult nut to crack,’ he admitted. Nationals councillor Alan Hunter, who is a farmer, said the impact would fall most heavily on farmers, who ‘may be forced to reduce their herds by half and the land they farm by half’ under the plan. ‘What would become of the rest of the land – and what about their incomes?’ he asked council. But Cr Dey said the value added by the ‘zero emissions’ brand would more than compensate. ‘We already have a great brand, which is Byron, which is recognised and attracts a premium,’ he said. ‘If you add “zero emissions” to that I think you’ll find the premium the product will attract will more than balance out any loss of production,’ Cr Dey said. ‘Nothing will happen without community consultation,’ he told the meeting. Cr Richardson said a similar aim for the shire to become pesticide free ‘seemed like pie in the sky to some at the beginning but in fact we’ve come a long way towards that goal in a year and a half’. The motion was carried with councillors Cubis and Woods voting against. Councillors Spooner and Ibrahim were absent from the chamber. BYRON Shire Council are aiming to reduce their greenhouse gas emissions by a minimum of 30% under their Low Carbon Strategy. Recently placed on public exhibition for community feedback, the third edition of Byron Shire Council’s Low Carbon Strategy has been adopted. Mayor Simon Richardson said the Byron Shire Low Carbon Strategy updates and builds on the Byron Shire Greenhouse Action Strategy to showcase actions completed, set new actions on climate change and incorporate peak oil preparedness into Council’s operations. As a target, Council aims to reduce greenhouse gas emissions by a minimum of 30% from 2003-2004 levels, by 2020. The strategy features 87 actions across Council, including projects such as the investigation of large-scale solar power, organic waste collection, electric vehicle charging stations, and investigating opportunities for the use of biogas/bio-diesel in the Council fleet. Council’s sustainability officer Kim Mallee said the actions outlined will be delivered over the next three years in collaboration with the community. As a member of the Cities for Climate Protection program, Byron Shire Council developed the original Greenhouse Action Strategy in 2004 to identify ways to reduce greenhouse gas emissions. Ms Mallee said that being aware of where, when and why gas emissions are being generated is fundamental in understanding how improvements can be made. The three areas that contribute towards Council gas emissions are general electricity (72%), street lighting (9%) and fleet of vehicles (19%). Ms Mallee said key ways in which Council was tackling gas emissions included retrofitting lighting within buildings, installing solar hot water, solar power and removing methane gas from the landfill. “We can also expect to see reductions if LED lights are replaced in current street lights and the continued installation of solar power on key community buildings as funding becomes available,” she said. Mayor Simon Richardson said Byron Shire is home to an informed community who frequently set the bar high on environmental awareness and action. “Our community’s expectation to address and plan for the twin threats of climate change and peak oil is evident and this is why the Low Carbon Strategy is our road map for action,” he said. The Low Carbon Strategy is the third edition of the Byron Shire Greenhouse Action Strategy which has been actively implemented for over ten years. “It is through forward planning and our commitment to implementing the past two greenhouse action strategies, that Byron Shire Council will reduce its greenhouse gas emissions and help to reduce our community’s contribution to climate change,” Mayor Richardson said. “Local government are in a unique position to address climate change through its understanding of local issues and our flexibility to adapt to changing conditions. “Now more than ever, it will be the leadership shown by local government to continue efforts to address the sources of greenhouse gas emissions and prepare for the impacts of both climate change and peak oil,” he said. To read Byron Shire Council’s Low Carbon Strategy, click here. This is really great stuff- a very interesting read. This is the sort of material that should be coming out of our Prime Ministers mouth too. Why is it that people of vision seem to eschew that level of politics these days?